“Hot, cheap, and easy” usually refers to a fast food meal, but in this case, the phrase perfectly describes the outfit Kelly Rowland wore to her album signing last Tuesday. The 32-year-old singer styled a rock-meets-street outfit with an embroidered cross tank, red leather pants, red pumps, and gold chain jewelry. The look is cute, chic, and deceptively cheap as the price on the tank, the outfit’s pièce de résistance, is a mere $12.80. You wouldn’t know it just by looking at Kelly Rowland as she rocked her outfit like the star that she is. 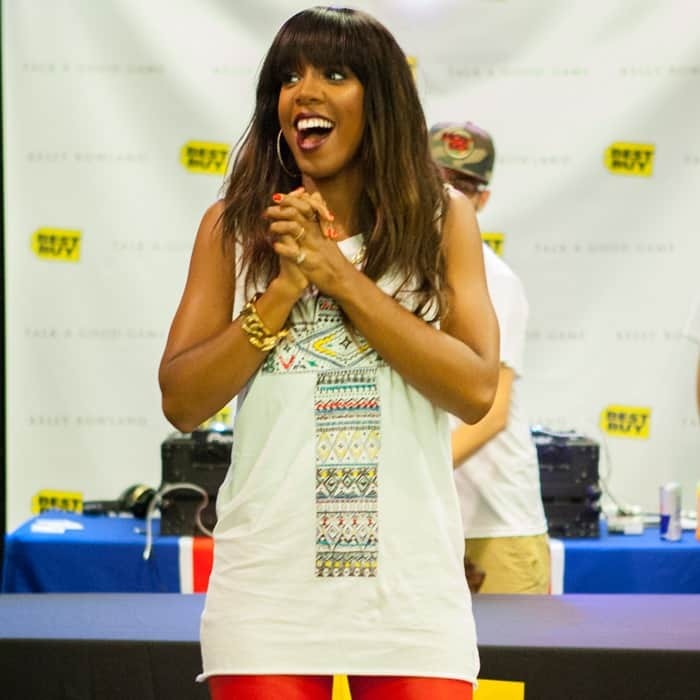 Because one of the major pieces of Kelly Rowland’s outfit is cheap, it’s also very easy to get! Grab the tank in white or black at Forever21, and then steal the rest of Kelly Rowland’s style with the just-as-inexpensive lookalike items we’ve gathered for you below. As for Kelly Rowland’s red leather pants, they’re actually by Balmain, but thank heavens we’ve got faux leather pants and waxed denim jeans!